Gosh I love chocolate, but caramelly goodness comes a close second. It doesn’t matter what form that caramel taste comes in, but one of my faves is English Toffee. Especially my Aunt Ginny’s English Toffee, but if I can’t have that, I’ll settle for a Heath or a Skor…you won’t have to twist my arm. I thought I’d give it an update. Bring it up a bit to today’s taste. Coz there’s no denying we all want more. More ooey gooey goodness, more flavor, more looks, more of everything. And of course, more chocolate! You can never go wrong with more chocolate! And so the grand experiment began. First off, a 10″ spring form pan, coz round just seems a bit fancier. I’m not so sure that the pan improved the looks any, but it did look better in “person.” Then more toffee (I used a package of Heath English Toffee Bits with Chocolate, instead of cutting up candy bars.) Then more Chocolate. The only thing that held me back at all was fear of disaster if I added even more, lol! I think I put about as much toffee & chocolate as that batter would hold, and in to the oven it went. I think my little experiment was a huge success – very moist, very delish – and perfect for a casual dessert or with a little coffee as a snack. Prepare 10″ spring form pan by turning the bottom upside and lining it with heavy-duty foil. Put together with the bottom upside down (foil side up)and grease or spray the foil lined bottom. Sprinkle the pan with a heaping tablespoon of flour, shake and turn it around until the bottom and sides are coated and tap out excess. With a mixer, in a larger bowl, blend butter, sugar and flour together. Reserve 1/2 cup of the mixture in a medium-sized bowl for the streusel and set aside. On low-speed, add baking soda and salt. Add buttermilk, egg and vanilla, beating until just combined. Spread about 2/3’ds of the mixture in the prepared pan. To the bowl holding the reserved mixture for the streusel, add the package of Heath bits and 1/2 cup of miniature chocolate chips and mix together. Sprinkle about half of that mixture over the batter in the pan. Dollop remaining batter over the top and holding a butter knife vertically, swirl the mixture together. Top with remaining streusel mixture. Bake for about 40 to 50 minutes until a tester comes out clean and when gently pressed, the cake feels on the firm side. Cool on a rack for 10 minutes, run a thin knife around the inside edge of the pan and remove sides. Allow cake to completely cool before carefully inverting the cake and removing the bottom of the pan and foil. You may need to slide a long, thin knife along the foil. Turn back up onto serving platter, replace any lost crumbs and serve. To bake in a 9 x 13″ pan, grease or spray, dust with flour, shaking out excess. Add batter to the pan then sprinkle the streusel mixture over the top. Bake at 350 F. for 35 minutes. This entry was posted in Click here for Fabulous Food Posts and tagged Cake, Chocolate, Chocolate Chips, Desserts, Family Recipe, Frugal Hausfrau, Heath Bar or Bits, Toffee. Bookmark the permalink. I made this cake today and it is incredible! Thanks so much for stopping by to let me know! This was a cake my Mom used to make – she would have been so pleased to hear that. Please, oh please, appear in my kitchen NOW! Toffee, chocolate and cake, oh my! This sounds so delicious. I’d love a slice of this with a cup of tea. Thanks for sharing with us at FF! The answer is always more chocolate!! What a great looking cake. I am sure you mom’s was good… but this looks great! 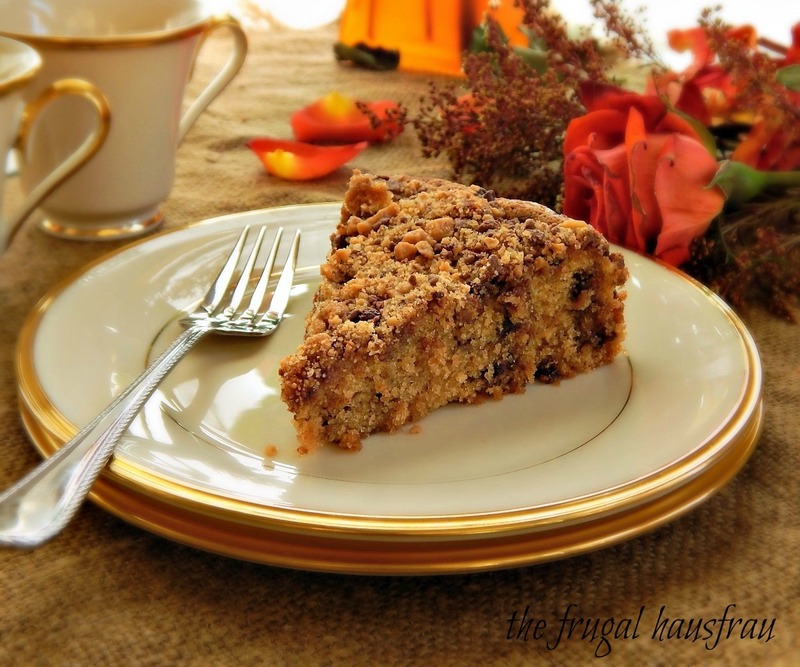 Toffee is one of my very ingredients and this cake looks delicious! Lots of good ingredients in your cake, especially the Heath bits. Good job and Happy FF! Aren’t those heath bits cool! 🙂 They just melt into the cake part but stay a little crunchy on the top. Thanks for hosting FF for us! Oh yum !!! great idea !!! WHAT??!! Ben and Jerry’s makes heath bar ice-cream!!?? I feel like a kid that’s only been just told there IS a Santa Clause and finds they’ve been missing out. Ha. Thanks for the compliment on the cake and I’m looking at the time right now, lol…really too late to make a run into the city, lol! The cake sounds and looks incredible Mollie. Love heath bars, they have always been one of my favorites and this cake is so tempting and your photo’s are beautiful. Thanks, Susanne! I’m funny, I hardly EVER eat candy. But when I do it’s a heath bar or a plain chocolate hershey’s bar. Every 10 years or so, a milky way…or maybe milk duds…. You recipes this week have been most impressive!! I’ve been having a fun week, and thanks! And today, never having ever tasted them, I made fried green tomatoes! OMG! I feel like I’ve been cheated all my life…who knew? lol!! That post coming soon! Oooh looking forward to it! My tomato harvest is long gone from this year. I’m sure I’ll save the recipe for next year! We left some on the vines, I mean seriously there were so many…and I’m not a big canner…but I walked out today and there were some that had ripened! The vines grew so dense that all the ones left in the center were untouched by the frost and had turned red! But I heard that the best fried green tomatoes are ones that have been exposed to frost, so I used a few of those. We are having such unusual weather here, really. Of course, being from MN, it seems really extra super warm to me, but it really is warm this fall, even for SD. I think the picket fence around the garden has helped, too, as well as spruce trees just to the north. Toffee and cake combo. I’m in.